We have known for a long time that aerobic exercise increases heart rate variability (HRV) when performed regularly, but a new paper on a study performed by experienced French & Australian researchers, Chalencon et al., set out to look in more detail at the relationship between training load, performance and HRV. Importantly, they were trying to build a model that would allow elite swimmers’ performance to be predicted from training load and HRV (indicating both recovery and aerobic development). Data were gathered from the 10 swimmers weekly over a period of more than a year, including HRV measurements before performing a 400m time trial assessment. In fact the relation they found was so strong that they concluded using performance or HRV as the systems (model) output provided the same information on the impact of training on the fatigue and adaptation status of the athlete. Taper periods need to be quite long (2-3 weeks) in order for adaptations to really take hold. For an individual using ithlete to measure HRV, this could mean continuing the taper until no further rises in HRV are seen before starting to ramp up the next training block. 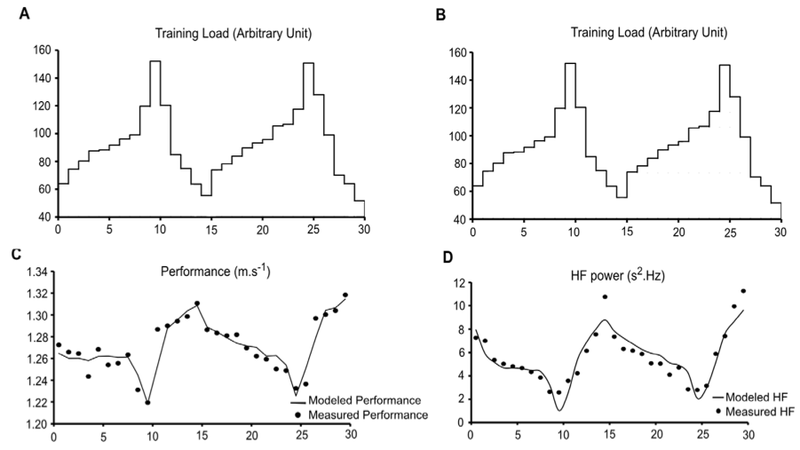 Conversely, if HRV is not decreasing during an intensive training block – you’re not working hard enough. There is no significant difference between genders in the model, implying that HRV based training is equally applicable for men and women. 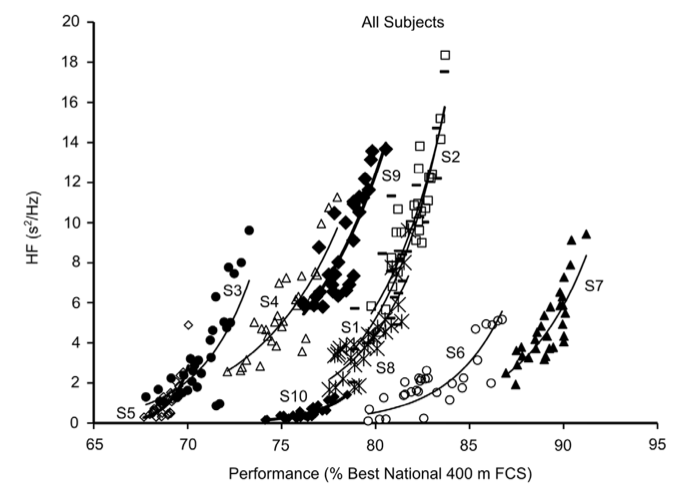 It’s not the athlete with the highest HRV that wins, it’s the athlete that manages to increase their HRV the most that gets the biggest gains in performance. Anyone can repeat this study for themselves by doing regular performance tests in their sport and seeing how well their daily (or baseline) HRV correlates. We’d be really interested in hearing from anyone that has done this! I have been using the iThlete regularly and I have found the HRV reading to increase during the taper period. Prior to the 2010 Bupa Great South run I steadily saw HRV readings increase to near maximum levels for me during the taper period. At the race I went through the 5 mile point 30 seconds faster than my 5 ml PB. I matched my 10K PB at the 10K point and then just fell outside my 10ml PB at the end. I was 53 and my 10ml PB was set when I was 40. My time of 56.42 ranked 6th fastest for a vet 50 in 2010. This was a post race observation and I knew before the race that I was feeling good. What would be better now is to have the HRV information in advance and know you are going to run well. That boost in confidence could well bring down the times a little further. I have been using the ithlete from Jan 2012 to May 2012 building up for the Road and TT Age Group Nationals in NZ. Then I had a break until end of Nov 2012 and used it again since then to build up for a half iron men in Nov 2013. I like the ithlete (not sure why) and measure almost every morning but struggle to get really meaningful data out of it. For example, for the build up to the Nationals I progressively increased training load and intensity – and yet – my HRV had a trend upwards – the opposite to the study. (Maybe I didn’t train hard enough?). This time around I use the Mafftone system very strictly and MAF performance goes up every MAF test in running and cycling. I hardly increased the training hours and not the intensity at all over the last two months. My HRV was pretty steady. However, I had my first all-out high intensity 25 km 5 days ago. After that my HRV jumped up almost 20%. I noticed that in the past. After a high intensity effort my HRV goes up and I would expect it to go down. Really confused to figure it out. Any ideas anyone? One thing that does make sense though is that my HRV usually drops after bad/short sleep or drinking alcohol in the evening. Andrew – that sounds like a good recipe, and mirrors what I have learned about the training of elite endurance athletes, who under coach supervision polarise their training between high volumes of aerobic (MAFF) work and intense intervals that are chosen to represent the tough parts of their events. The mistake most recreational athletes (and even so pros) make is to assume that more intensity is always better, which quickly leads to staleness, and a perpetual state of incomplete recovery. I also heard that Mark Allen alternated base building and switched to intensity when the gains stopped accruing, and back again when recovery was needed. I like the analogy of a diesel engine with a turbo – the aerobic work builds the ability to deliver power continuously at low revs, whilst the turbo adds horsepower at the top end. I think you are right that correct periodisation should lead to an HRV baseline that climbs over the long term when compared during aerobic base building (MAFF) periods.